My name is Joseph F. Bailey II, TDC #1300260. I’m a prisoner confined within the Texas Department of Criminal Justice at the William P. Clements Unit. At all times relevant to this statement, I was so confined. I am familiar with Kevin “Rashid” Johnson, TDC #1859887, who is also confined at the same unit, and we were both housed together on the same pod, K-pod, in the segregation section of the unit. On March 26, 2017, I was aware that several officers conducted what appeared to be a cell search of “Rashid’s” cell, #201 K-pod, and claimed to have found a made weapon. 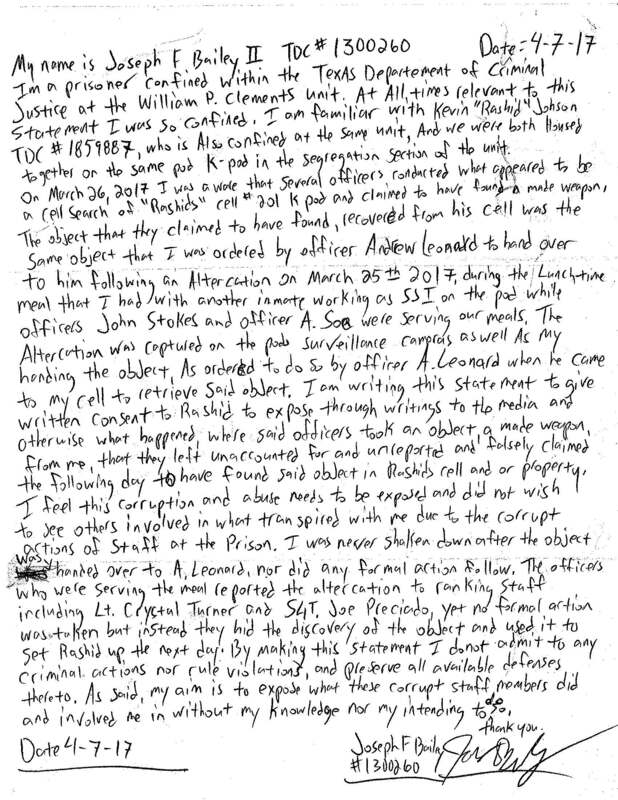 The object that they claimed to have found recovered from his cell was the same object that I was ordered by Officer Andrew Leonard to hand over to him following an altercation on March 25, 2017, during the lunchtime meal that I had with another inmate working as SSI on the pod while Officers John Stokes and Officer A. Soe were serving our meals. The altercation was captured on the pod’s surveillance cameras, as well as my handing the object, as ordered to do so by Officer A. Leonard when he came to my cell to retrieve said object. I am writing this statement to give written consent to Rashid to expose through writings to the media and otherwise what happened, where said officers took an object, a made weapon, from me, that they left unaccounted for and unreported and falsely claimed the following day to have found said object in Rashid’s cell and/or property. I feel this corruption and abuse needs to be exposed and did not wish to see others involved in what transpired with me due to the corrupt actions of staff at the prison. I was never shaken down after the object was handed over to A. Leonard, nor did any formal action follow. The officers who were serving the meal reported the altercation to ranking staff, including Lt. Crystal Turner and Sgt. Joe Preciado, yet no formal action was taken, but instead they hid the discovery of the object and used it to set Rashid up the next day. By making this statement, I do not admit to any criminal actions nor rule violations, and preserve all available defenses thereto. As said, my aim is to expose what these corrupt staff members did and involved me in without my knowledge nor my intending to do so.